After the 1845 Poor Law Amendment (Scotland) Act, poor law provision in Glasgow was divided between four parishes: Barony, City, Govan and Gorbals. Gorbals never set up a poorhouse and was absorbed by Govan in 1873. Glasgow's Barony Parish Poorhouse at Barnhill was erected in 1848-53 to designs by George Bell and	William Clarke. It was described in 1882 as "a very capacious asylum for the children of poverty and well adapted by its cleanliness, ventilation and position to mitigate the ills of their condition." In 1885, Malcolm M'Neill (Visiting Officer for the Board of Supervision) reported on conditions at Barnhill. The "Class C" diet he refers to comprised meal and milk for breakfast and supper, and bread and meat-broth for dinner. The House appeared to me clean and orderly throughout. My attention was attracted by the large amount of bread etc. stored in the Infirm Wards, and on enquiry I learned that the issue is made but once daily instead of with each separate meal. The Committee should consider this subject and in my opinion should direct the issue of each ration complete at the meal hour, and the removal after a reasonable interval of the unconsumed food. The women in the washhouse still receive tea and bread in addition to class C diet — an unnecessary, and in some respects, mischievous indulgence. The diet of the children is wisely varied, and their appearance is satisfactory, but I must still urge the substitution of sweet milk for butter milk in the whole of this class. When the furnishing of the test wards is undertaken I should propose to the Committee the abolition of the double bed to contain mother and child, and the introduction of a small crib for each infant, placed beside, or at the foot of, the mother's bed. According to Barr (1972), strict discipline was observed in Barnhill. Able bodied inmates were required to make up 350 bundles of firewood per day and stonebreakers were expected to break 5 cwt. per day. Any inmate not producing the stated amount was put on a bread and water diet in solitary confinement for 12 hours. Disorderly conduct such as swearing or breaking of rules, resulted in being put on a diet, excluding milk and buttermilk, for a period of three days. In 1904, the Glasgow City and Barony parishes merged. Barnhill was reconstructed and enlarged and the City poorhouse was closed. 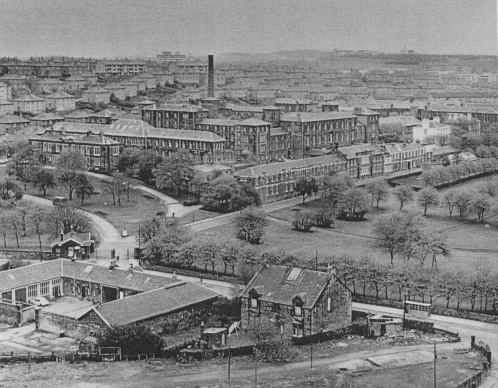 The existing inmates from City were moved to Barnhill which now became Scotland's largest poorhouse. With the creation of a single poor law authority in Glasgow, three new establishments were built: Stobhill Hospital, and the Eastern and Western General Hospitals. These are described on the separate Glasgow City web page. The staffing in the infirm departments was inadequate. The report also noted the discovery that members of the Parish Council visiting the poorhouse had been given lunch, and that during the previous financial year they had consumed 36 bottles of whisky. During that period 30 visits had been made, of which 13 were by professed teetotallers. I am pleased to report that the Institution is sufficiently staffed, and that in each department the duties are performed in an intelligent and efficient manner. In illustration of the harmony and good feeling existing throughout the whole staff, I may be pardoned for stating here, that croquet, cricket, and football are engaged in; there is also a Glee Club, and Magazine Club. A social and dance was also held during the year. These various functions have created, and are calculated to maintain, a good helpful spirit amongst the staff, which means cheerful and better service. The dietary of the inmates as to quantity is regulated by the scales sanctioned by the Local Government Board. The quality is good. Strict attention is given to the deliveries of all articles of food from contractors, to ensure that the quality as fixed by the Contracts Committee is maintained. The greatest care is exercised in the preparation, cooking, and distribution of the diets to the inmates. The conduct and behaviour of the inmates has been very satisfactory; with the exception of a few inmates who had absconded with the house clothing, no inmate has been subjected to the slightest punishment during the year. An endeavour is made to find employment for all inmates able to work. For the repair and upkeep of the buildings all tradesmen inmates, such as joiners, slaters, plumbers, painters, and engineers, are, as a rule, engaged at their respective trades. In like manner — for the repair of clothing, bedding, and shoes — tailors, shoemakers, and upholsterers, and in the bakehouse, bakers who become chargeable, are utilised at their own trades. During the year three of Flowers' Patent Automatic Hand Looms have been fitted up and a considerable quantity of tweed, plaiding, and flannel has been produced. There has also been secured in the course of a year a supply of Manilla and hemp rope to be teased. Those materials are clean and easily handled and make very suitable work for a large number of old men. Firewood and firelight making, fieldwork, scrubbing, cleaning, coaling, and the carrying of articles of food and clothing to the various departments of the Institution are done by the male inmates. The road from the main gate on the south, side of the building, going east, to the new block, has been dug up, re-bottomed, and made with road metal, also kerb and flats laid to form gutter. This work has been wholly done by inmate labour since January of this year. Saw guards for the protection of the circular saws in Firewood Department, have now been provided, and are acting very satisfactorily. A model of the guard was, at the request of the Local Government Board, sent to them, and they were pleased to express their approval and appreciation of the efforts made to prevent injury to inmates engaged at these saws. The female inmates are engaged in laundry, sewing, knitting, cope-teasing, scrubbing, and cleaning. There is also the work of the Brabazon Employment Scheme, which includes wood-carving, rug-making, basket-making, iron, copper, and brass work, sketching, fancy needlework, &c. A goodly number of both men and women receive instructions in these handicrafts from the ladies of this society. The form of work at present provided for the inmates is quite suitable, and in all branches is carried on at considerable financial gain. In 1945, Barnhill was renamed Foresthall Home and Hospital. After the introduction of the National Health Service in 1948, it catered mainly for vagrants but had a geriatric section which was closed in stages between 1978 and 1983. The building was demolished in 1988. As well as the Barnhill poorhouse, Barony Parish erected a mental asylum at Woodilee in Lenzie in 1875. Glasgow City Archives, The Mitchell Library, 210 North Street, Glasgow G3 7DN, Scotland. Holdings include: Plans of Barnhill poorhouse (c.1876); Abstract of receipts and expenditure of the poors fund (1849-50); General registers of poor (1868-84, incomplete); Applications for poor relief (1861-98, incomplete); Reports on poorhouse accommodation (1881-88); Registers of admissions and discharges (1940-78); Register of admissions and dismissals of children (1914-53); Registers of deaths (1949-74). Glaswegiana — A Collection of Stories of Glasgow Past and Present by William W Barr (Vista, 1972).